One hundred and fifty years ago, the corporation was a relatively insignificant entity. Today, it is a vivid, dramatic and pervasive presence in all our lives. Like the Church, the Monarchy and the Communist Party in other times and places, the corporation is today’s dominant institution. But history humbles dominant institutions. All have been crushed, belittled or absorbed into some new order. In this complex, exhaustive and highly entertaining documentary, Mark Achbar, co-director of the influential and inventive Manufacturing Consent: Noam Chomsky and the Media, teams up with co-director Jennifer Abbott and writer Joel Bakan to examine the far-reaching repercussions of the corporation’s increasing preeminence. 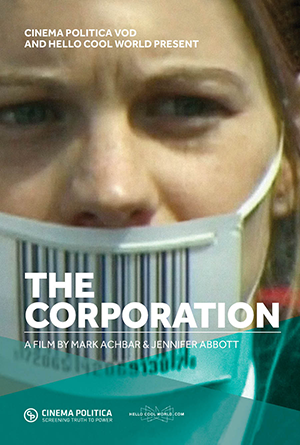 Based on Bakan’s book The Corporation: The Pathological Pursuit of Profit and Power, the film is a timely, critical inquiry that invites CEOs, whistle-blowers, brokers, gurus, spies, players, pawns and pundits on a graphic and engaging quest to reveal the corporation’s inner workings, curious history, controversial impacts and possible futures. The Corporation charts the spectacular rise of an institution aimed at achieving specific economic goals as it also recounts victories against this apparently invincible force. Case studies, anecdotes and true confessions reveal behind-the-scenes tensions and influences in several corporate and anti-corporate dramas. Among the 40 interview subjects are CEOs and top-level executives from a range of industries: oil, pharmaceutical, computer, tire, manufacturing, public relations, branding, advertising and undercover marketing. In addition, a Nobel-prize winning economist, the first management guru, a corporate spy, and a range of academics, critics, historians and thinkers are also interviewed. We've partnered with Cinema Politica to release the new 10th Anniversary version on video on demand worldwide! Along with the groundbreaking 145-minute theatrical version of the film, the 2 disc set has 8 hours of additional footage, 2 commentary tracks, deleted scenes, and more!